Okay, so chicken salad might not seem like the most exciting first recipe to post. However, it has a very special place in my heart, and my boyfriend's tummy. This is the very first recipe my best friend and former roommate and I tried to cook together. It's a very simple recipe, and an adaptation of this from the food network. Basically, we just took that recipe and took out all the things we didn't like, and added some we did! For some reason, after making it for my boyfriend when he came to visit me, it has become his all time favorite! He's literally obsessed. And so are his fraternity brothers. Whenever I visit the house now I have to come with a huge bowl of it to keep everyone happy! It is so great as a sandwich, over lettuce, or my personal favorite, with gluten free crackers! It's easy and if you make a ton it can last for a few meals at a time. Here is the basic recipe I use, but feel free to tweak it to your liking. Hope you enjoy! In a mixing bowl, toss together the chicken, celery, grapes and herbs. Set aside. In a small bowl, whisk together the mayonnaise, lemon juice, mustard, salt and pepper to taste. Add to the chicken and mix gently until combined. Refrigerate until ready to serve. Note: If you let it refrigerate for at least an hour before trying, the flavors mix and it tastes even better! 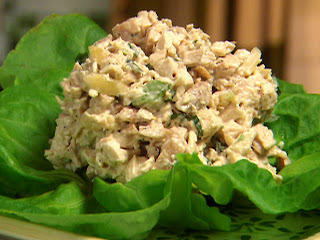 mmmmmm i LOVE chicken salad - this recipe sounds amazing!